Running Reader Q: I Cross-Trained And Still Got Injured—What Gives? 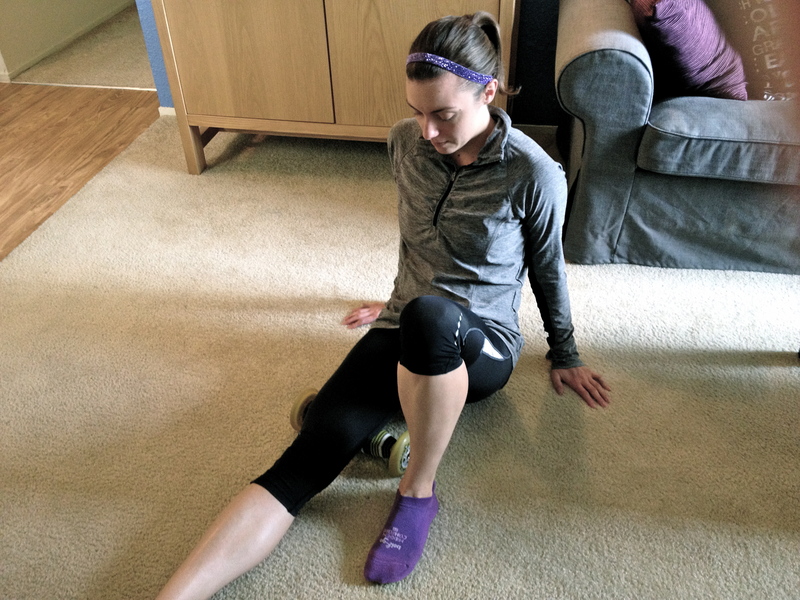 Regularly rolling out your legs after running helps ease tightness by breaking up the fascia around your muscles and can prevent injuries down the road. Emily P., a regular Some Kind Of Runderful reader, is dealing with her first running-related injury. She’s fairly new to pavement pounding, and she was smart with the build up. She ran an easy pace three days a week for the past five months, “Plus, I did two days of exercises with weights in the gym,” Emily says. Despite her careful routine, she still managed to pull a hammy. “It was during my very first 5K two weekends ago. I was a few feet from the finish when something in the back of my leg popped. I practically had to limp to across the line,” she says. A quick trip to the doctor confirmed a strain and, luckily, no major muscle tearing. Now, Emily is nursing a sore hamstring and a bruised ego. “I just don’t get it,” she says. “I’ve been cross-training and I thought I was doing everything right. Where did I go wrong?” To help me find the best answer for her, I reached out to Dan Trink, a fitness trainer and director of training operations at Peak Performance in New York, NY. Dan, what do you think brought on Emily’s injury? Most running injuries are not acute, meaning someone doesn’t run out from behind a tree and hit your leg with a stick when you’re in the middle of a 5K. The injuries incurred from running are caused by overuse or muscle imbalances. But Emily’s been hitting the weight room to build muscle. She may have been focusing on the wrong types exercises, or ones that use the same muscles and motions as running. Too many people mimic the energy system that they utilize in running in their strength training, which means that they try to build strength-endurance by only doing high-rep sets or metabolic circuits. Most runners are better served by increasing their strength with high-weight, low-rep sets in the weight room. Logging miles gives you plenty of endurance for running, but you’ve got to rely on your strength training to help you get stronger and keep injuries at bay. What’s the best way for Emily to work through this injury? Very often overuse issues and muscle imbalances can be resolved with a smart strength-training program that not only builds foundational strength, but also incorporates foam rolling and soft-tissue work, dynamic warm-up and activation drills, and pre-hab or rehab movements as well as strength movements that will give you more stability and reduce your chance of the injury recurring when you return to running. What should Emily do when she’s done with rehab and ready to run again? The key is not to get carried away, thinking she can drop everything else now that she’s running again. She should maintain a strength-training program that still includes all of the factors I mentioned before. Thanks, Dan. This is great advice. Any time! By the way, how are your arms? Are you still working on your upper body strength? I’ve been through my fair share of injuries and I know how frustrating the recovery period can be. Your body will tell you when it’s ready to run again—but you have to be gentle with yourself and listen. Wishing you many more happy miles, Emily P.! What’s the worst running injury you’ve ever been through? Got any rehab tips to share?